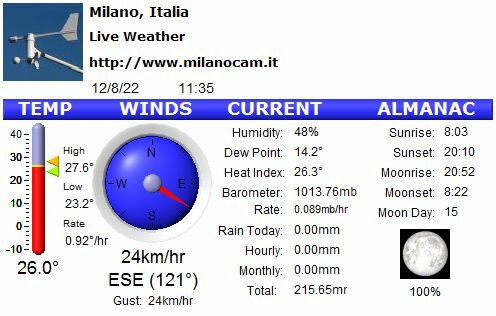 MilanoCam is an open project providing webcams and weather live from Milano. Real time temperature, humidity, pressure, wind and rain from Milano - Cadorna (via V.Monti 41, lat. 45°28'25'' N - lon. 9°10'15'' E). from Milano - Cadorna (via V.Monti 41, lat. 45°28'25'' N - lon. 9°10'15'' E).